It was at Microsoft’s TechEd North America 2013 conference in New Orleans where I first heard the announcement that Visual Studio’s “One ASP.NET” templates would begin including Bootstrap. A single slide in Damian Edwards’ “Microsoft ASP.NET, Web, and Cloud Tools Preview” session summarized it nicely. Boot what?!? At least that was my initial reaction. What’s this newfangled styling and layout framework? More importantly, why should I care as an ASP.NET developer? I returned to the office the following week and began researching it. As a developer whose strong certainly isn’t CSS, the value-add became evident almost immediately. Fast forward a year or so, and I’m using Bootstrap for large-scale enterprise web development. All projects on which I was working involved development teams of varying skill levels, and none of us bared much confidence in our Bootstrap abilities. Needless to say, there was a lot of habitual misuse of the framework. Surely, one could mentor the developers to prevent these mistakes and inadvertent exploitation, but who was experienced enough to perform that role commendably? In short, nobody. To compound the dilemma, additional developers were being procured and were expected to get up-to-speed in a reasonable amount of time. This got me thinking. Could the development workflow be enhanced such that some mode of static analysis occurs during each and every build? Such a tool could partially fill the void caused by lack of expertise, which could expedite formal code reviews and make the review process feel much less intimidating. It turns out that the Bootstrap team had already solved this problem with a Node-based tool. Enter Bootlint, an HTML5 linter with an intimate comprehension of Bootstrap jargon and best practices. To preface things, this blog post assumes that Bootstrap is being used inside of MVC Razor views. This post also intends to be forward-looking. ASP.NET Core 1.0 is the focus; although, keep in mind that Bootlint may still be used with older versions of ASP.NET. The Beta 7 release bits were used here, so certain pieces may still be in flux. See below for specific instructions to upgrade your environment from Beta 6 to Beta 7. If that doesn’t pertain to you, it’s safe to bypass the remainder of this section. 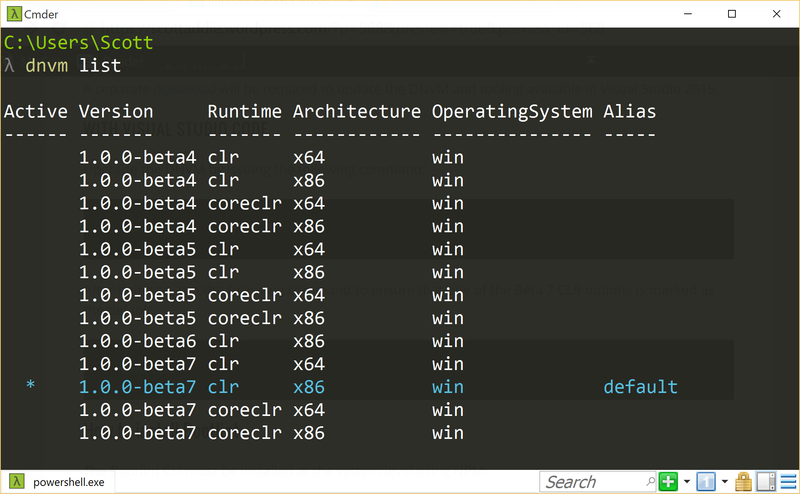 A separate Beta 7 download will be required to update the DNVM and tooling available in Visual Studio 2015. Take note of the default indicator in the screenshot below. Finally, make sure Node.js is installed with NPM. Once that’s done, integrate it into your development workflow. 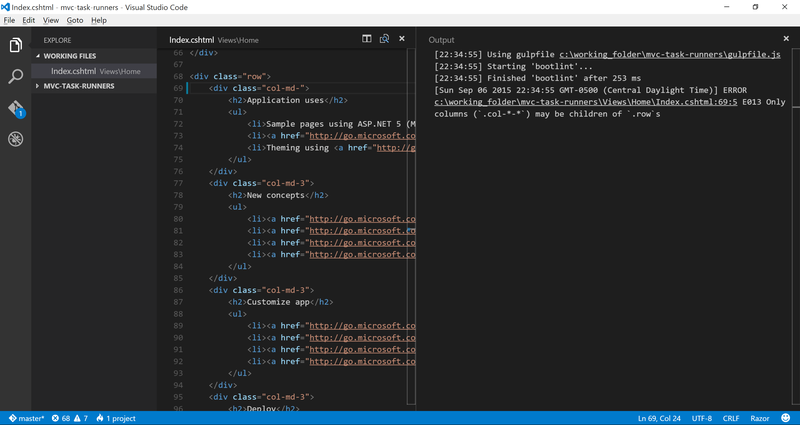 With ASP.NET Core 1.0, chances are that your development is being done in either Visual Studio 2015 or Visual Studio Code. The installation process differs a bit between the two products. See the specifics documented below. Don’t fret about locating the correct version number. Intellisense is provided within the IDE to assist with that portion of the key-value pair. Save the package.json file, and the dependency will be installed automatically via NPM. Expand the Dependencies/npm node in Solution Explorer to verify that it was actually installed. See the highlighted section in the screenshot to the right. 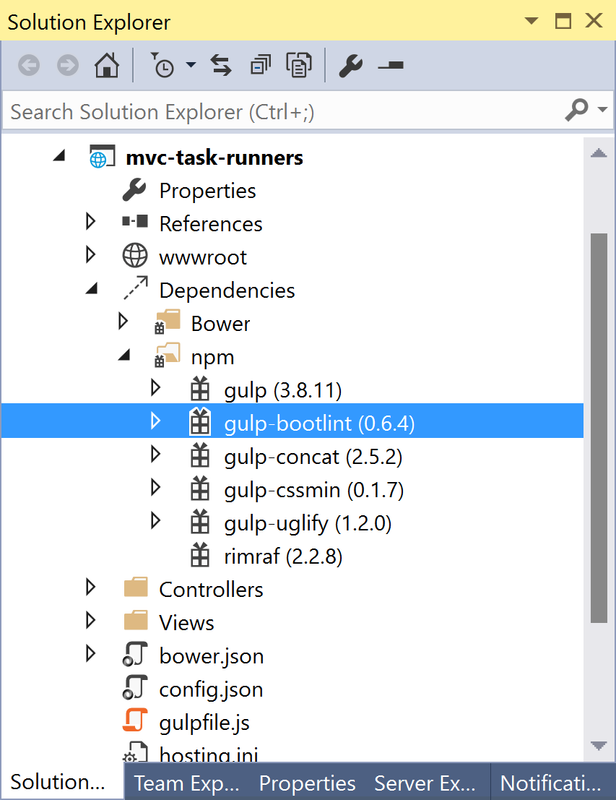 This new “bootlint” task will traverse the Views folder hierarchy recursively, analyzing each CSHTML view file it encounters by employing the gulp-bootlint plugin. To understand why these rules must be suppressed, refer to the master layout file contents provided below. Error code “E001” will appear for each and every view we decided to scan. Why? Remember that the file glob used in the Gulp task will capture all MVC views. 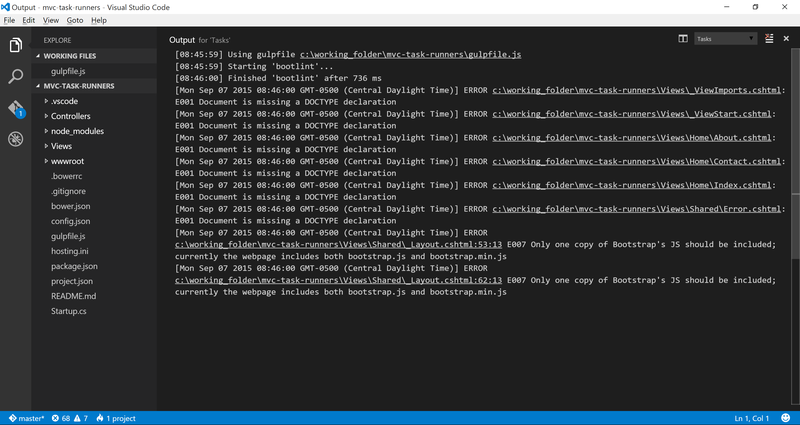 As you probably already guessed, Bootlint believes that something is awry because the HTML DOCTYPE declaration appears only in the master layout. There’s no wrongdoing in either case. Let’s dissect the reasoning behind the “E007” error code. ASP.NET Core 1.0 uses an environment variable called ASPNET_ENV. For the purposes of this example, set this variable equal to “Development”, “Staging”, or “Production” within the application’s debugging profile. As an aside, this variable can take on any value. The screenshot below depicts how this variable is assigned a value in Visual Studio 2015. In Visual Studio Code, the same can be accomplished via the commands section in project.json (see code snippet below). 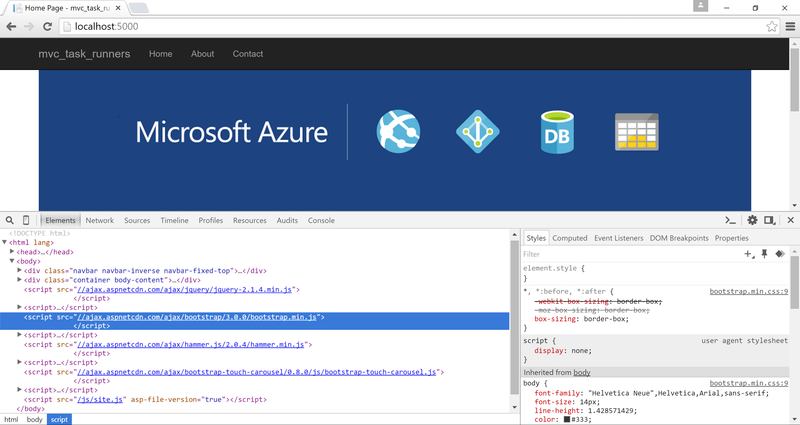 The “web-dev” command is Visual Studio Code’s equivalent to setting ASPNET_ENV equal to “Development”. 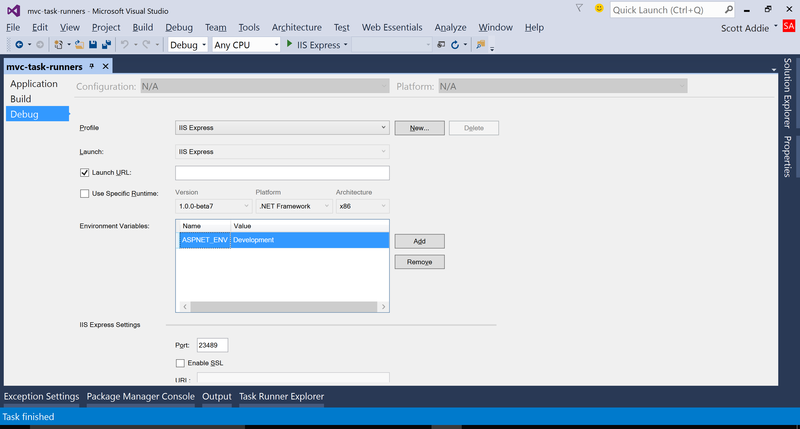 "web-prod": "Microsoft.AspNet.Hosting --server Microsoft.AspNet.Server.WebListener --config hosting.ini /ASPNET_DEV=Production"
The disabledIds option accepts an array of problem codes to be suppressed. The error message contains a line number, 69, which points to the exact location in which the CSS class name was changed. Now, add the missing number back to the CSS class name, run the Gulp task again, and notice that the error has disappeared. That was easy! Both options are disabled by default. 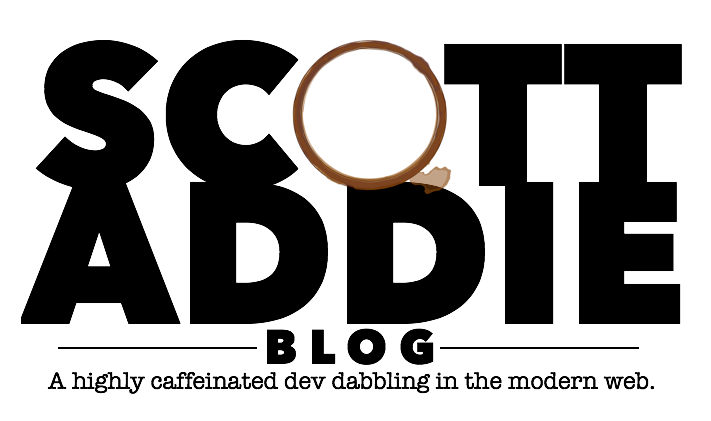 By setting stoponerror to true, the Gulp task in which Bootlint is executing will immediately halt when encountering an error (those problem codes prefixed with “E”). Likewise, stoponwarning will halt execution of a task when encountering a warning (those problem codes prefixed with “W”). This is useful when, for example, you don’t want to pipe into another potentially long-running Gulp operation if an error or a warning was encountered. Bootlint is an indispensable linting tool to have in your web development arsenal. Whether conducting a brief code review, just learning Bootstrap, or attempting to improve quality via automated builds, this is the appropriate tool for the task. After all, it’s much easier than one might think to inadvertently drift from Bootstrap’s best practices. With the proper configuration, Bootlint will help developers avoid an excessive level of cognitive strain.